RetinaLyze v2.1.0 has just been released! We are proud to present RetinaLyze version 2.1.0, which consists of small improvements to make the system easier to use.Not analyzed photosIt is now possible to open images that has not been analyzed. This makes it possible to see the image in the original size before analyzing it. So the user can evaluate the image before deciding to run an analysis on the image. We have added exclamation mark if there is a comment from the ophthalmologist. This will notify the user that there is a comment from the eye specialist even though there is no signs of DR and AMD. 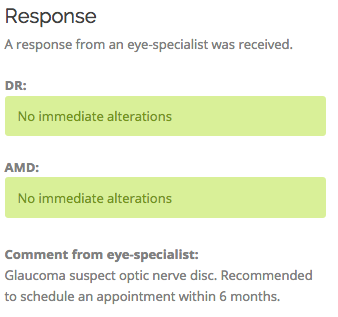 So the user will no longer miss a response if the eye specialist have noticed something different than DR and AMD. We have added two screenshots to illustrate the change. 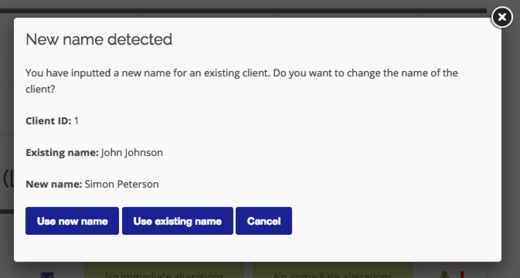 The user can now override a name on an existing client in the system. If the user uses an integration (RetinaLyzeUpload), then all he/she needs is to change the name in the camera software. Next time the user uploads a photo from the camera software it will be changed in the system. If the user uses the manual uploading formula on the website, and write another name on an existing client, he/she will be prompeted with a warning dialog. The dialog ask the user whether he/she want to make the name change. We have added a screenshot of the warning dialog. The statistics page has been optimized. It now loads 400% quicker than the old version. So now it only take a couple of seconds to serve the statistics page for the user.